The race at Challenge Copenhagen feels like a lifetime away and it’s hard to believe I am heading off to Kona tomorrow. So much has gone on in the aftermath of breaking the 9 hour IM barrier. To start with, one week after the race in Copenhagen, I clocked 1hr 48mins for a 50 mile TT winning by over 4 minutes. What really surprised me was how easy it felt. Can not really explain that one. I guess that with all this training you naturally go through cyclic peaks and troughs, with the aim being to peak in synch with your ‘A’ races. Guess my peak came a week late in this cycle! What followed on from this was a massive trough. With just over one month until the world championships out in Kona, I spent the next few weeks focusing all my effort on trying to acclimatise my body to the extreme heat that I am likely to face out in the lava fields of Hawaii. To achieve this I bought a small heating unit, a thermometer and set up a DIY sauna in my shed! Not pretty, but very effective. 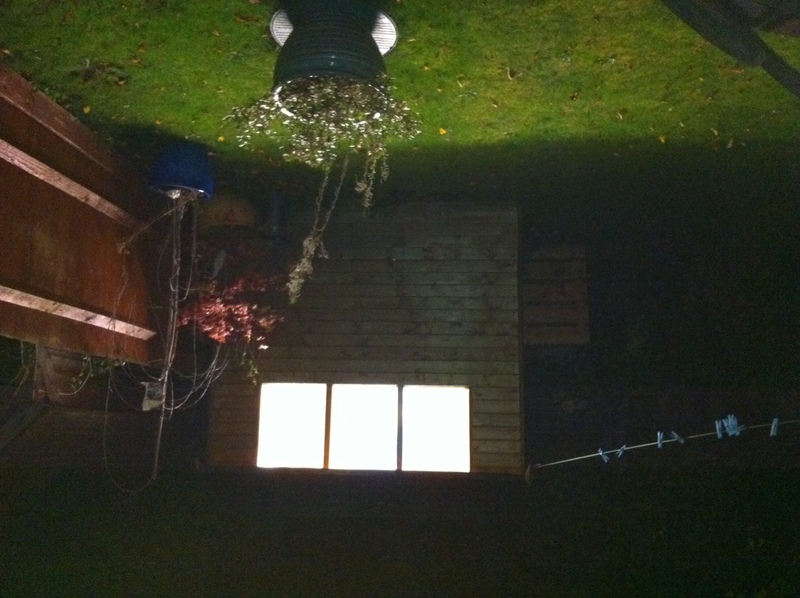 Since the shed is so small I was able to closely control the temperature and so I started my ‘Heat’ training. For the first week at temperatures of 30Deg C I was melting big time. After about 20-30mins my heart rate would spike and my power would drop to granny like numbers of 200Watts! After one week I still was struggling but starting to see a slight improvement in my ability for maintain a ‘normal’ power output at temperatures in the low 30’s. At this point I made the call to cycle the entire Kona course on my Computrainer at at 32 DegC. This was probably one of the toughest things I have ever mentally done. 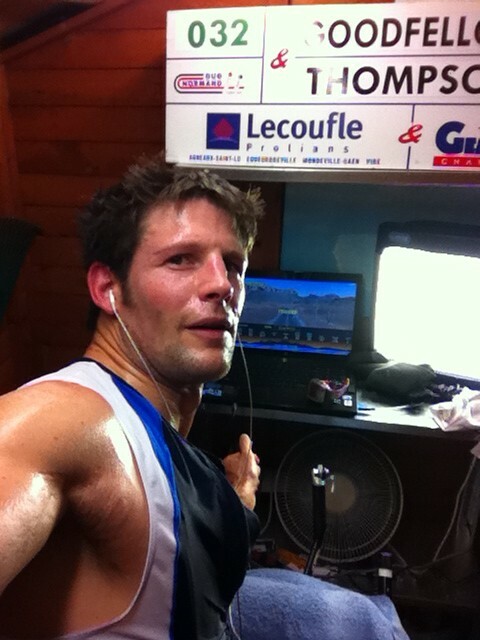 The very thought of spending 5 hours in a shed at 32 DegC cycling, even now, just sounds like torture! am now able to cycle comfortably at 40 DegC. Something I would have never though possible! Before heading off to Kona I had one more local race lined up, Challenge Henley, and it was one I was really looking forward to. I had entered it as a relay and would be doing the swim & bike leg, with a good friend of mine doing the run. What was very clear from the start of this race was that it was going to be cold! To be honest, the cold did not bother me at all. I actually liked it. Makes me wonder how much all this heat training will actually help. You are what you are, and I am a person who loves the cold. I am probably at my happiest running up the mountains in Zermatt at -15DegC. That is a world away from what I will be facing on the 8th October!! Anyway the swim was a good training session. A couple of swimmers shot off the front and I lead the second pack. It was an awesome setting and my mind was not really in the game. I was just enjoying myself to much. That resulted my in missing the turn around point. I started to wonder why no one was tapping my toes and when I looked back I realised why! Doohoo. Ended up swimming a couple hundred meters extra but no drama. I was out the water in 55mins and hit the bike reasonably hard but not flat out. It felt great to be out on the road again and not in that bloody shed. I was a happy man. At the 120km I was going well and on for a 4hr 35mins bike split. With over 6000ft of climbing that would have a been a pretty good bike split. Then I started to feel myself running low of fuel and the ‘bonk’ coming. Only problem was I was out of gels. I had figured since I was not doing the run, I would not need to take so much nutrition on the bike. WRONG!! So all I could do was keep on going an let the ‘bonk’ hit me. Man it hit hard. I made it to the next aid station, just, and a few gels later was feeling OK. But the school boy error with a lack of gels had cost me about 8 minutes. Still I managed a 4hr 44min bike split which I think was the up there with a very fastest pros so I guess it was an OK ride. Anyway, I am not going to make the same mistake again regarding calorie intake on the bike. Lesson learned. So all that remains is to head out to the big island. Soak up the surf, sun and enjoy what is going to be an awesome trip. Regarding the race, IF, and this is a very big IF, I don’t melt and managed to hold it all together I am hoping for good things. But I have got to be honest. I am kind of expecting to melt. What ever will be, will be. It has been one hell of a ride getting there. Just want to wish you very good luck for Kona from all of us in Essex, we will be following your progress all the way, can’t wait to read all about it when you return.